The Green Hills are the playground of local mountain runners who don’t have the time to drive to the notches but want to get some uphill running in. There are quite a few trails in the Green Hills Preserve (owned by The Nature Conservancy – click on the link for a great map of the area) that are multi-use that are used by hikers, mountain bikers, and snowmobilers in the winter. 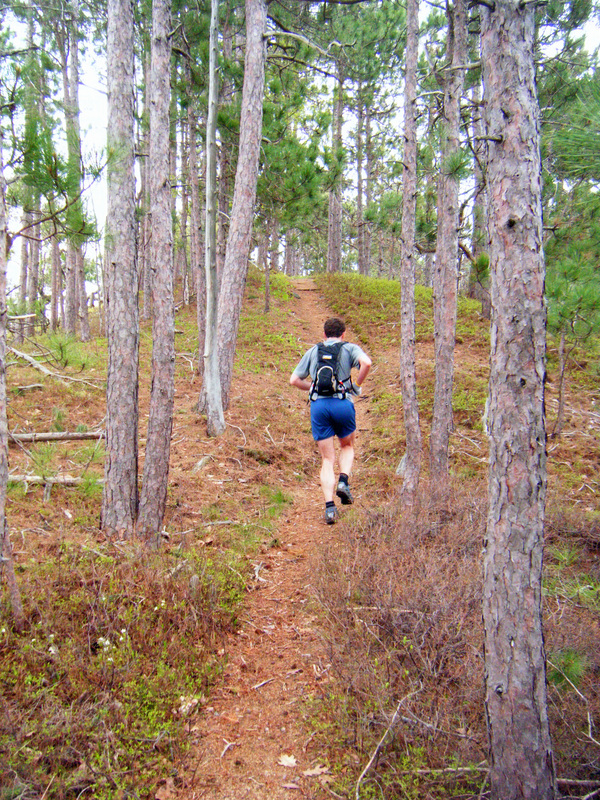 Many of the trails are quite rocky, but runnable. A detailed trail map is available at kiosks along the trail and at the above link. In the last few years, a multitude of single track trail has been added to the area. Not much of it is marked but, the rule of thumb with not getting lost on the single track is, if you go downhill you will come out at the power lines. If you go uphill, you’ll come out at the ridge. If you park at Walmart around the left hand side of the building, you can connect up with the Corridor 19 snowmobile trail, which has a variety of sections where singletrack comes in. If you do run on the Corridor 19 trail, check out the old Redstone Quarry ruins about a 1/2 mile in. You will see old lathes, boilers, wash houses, and, if you follow the correct piece of single track through the lathes, you can get to green granite quarry itself and see a piece of local history. Great running and great visuals. This trail starts at the parking lot at the top of Hurricane Mt. Rd. and goes to the summit of Black Cap where it connects to the Mason Brook snowmobile trail. The trail is rocky and rooted at the beginning but gets better. The last section before the summit is slippery when wet. There are great views in all directions from the top. Rather than taking the last section of slippery rocky trail up to the left, you will see the Black Cap Connector trail go off to the right. That way winds up the mountain on a much more runnable route. You will come to another fork where you should stay left to reach the summit. Taking the right fork will continue down on the Black Cap Connector. This trail is a great downhill run. It is very popular with mountain bikers in the valley. It criss-crosses a few clear cuts where there are great views of the Presidentials. The trail is well maintained by local mountain biking trails. Its quite the grind when climbing, but a great training run for Mt. Washington. The top of the trail starts by taking the Cranmore Connector from the Black Cap Trail. When coming form Black Cap the Red Tail Trail is on the right. Look carefully as the trail is not marked. The trail ends by the water reservoir tank at the bottom of Hurricane Mt. Rd. A new trail (2009) in the area, you can make a nice loop up and down Black Cap by going up Kettle Ridge, then taking a left on Cranmore Connector trail and then a right on the Black Cap Trail to the summit. On your way back down, take the red Tail Trail. Trail starts from the small parking area near the water reservoir tank at the bottom of Hurricane Mountain Road. To get to the trail, run past the gate and then up to the right of the water tank and the trail starts just to the left above the reservoir in a recently logged area. This trail is the central artery so to speak of the Green Hills Preserve. It starts at the Pudding Pond trailhead and crosses under the powerlines. The trail reaches an intersection with the Middle Mountain Trail (steep and rocky). After bearing left at the intersection the trail crosses the side of the mountain until it meets another trail at the Thompson Rd. kiosk. The trail starts to climb and eventually meets up with the Black cap Connector / Mason Brook Trail. A left turn (uphill) will take you to Black Cap; a right turn (downhill) takes you to East Conway Rd. From the Pudding Pond kiosk, make a left underneath the power lines and head straight across on the trail into the woods. This is the Peaked Mt. Trail. About a 1/2 mile in, you will come to a fork. To the left the Black Cap Connector/Peaked Mt. Trail, to the right is the Middle Mt. Trail. Follow to your right to head up Middle. You can make a loop out of Peaked and Middle. The trail that connects the two of them is kind of wet so be careful on the footing on slick, mossy rock. Another trail of note you will see as you start to head up the Middle Mt./Peaked fork mentioned above is a sign that has a picture of a mountain bike or a small sign that says “trail”. If you follow that off to the right, it’s a lot of fun single track that will eventually take you to the Redstone Quarry area. You can also make a challenging 13+ mile loop that can take upwards of 3 hours depending on your endurance and conditions. Park at Hemlock Lane (see below on how to get there) follow the dirt trails over the train tracks and connect with the Corridor 19 Snowmobile trail. The trail curves around to the left and then to the right under the power lines. Just after the power lines, look for some single track trail on your left. Take that into the woods and keep on going until you cross a brook. Immediately after the brook, take the trail to the right that goes straight up Rattlesnake Mountain. When you summit Rattlesnake, you can follow a little used single track trail to Middle Mountain and then over to Peaked Mountain. As you then descend on Peaked, take the trail to the Black Cap Connector Trail to the summit of Black Cap. On your way up Black Cap, make a note of the Mason Brook Trail on your right as you will be coming down that way on your return trip. 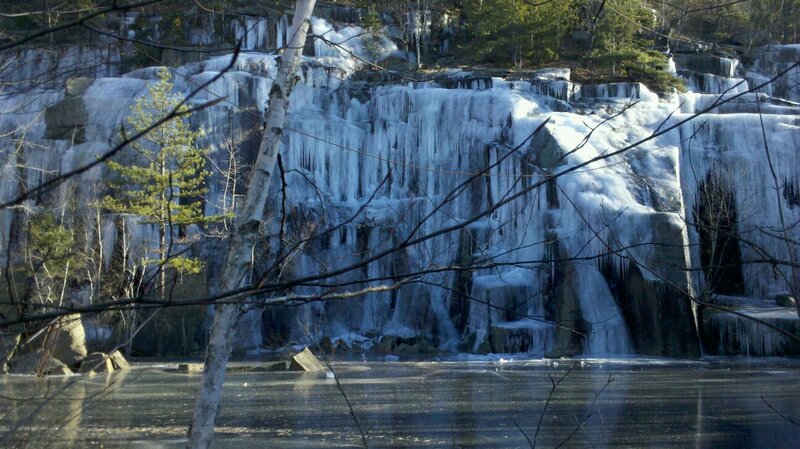 Once you summit Black Cap, turn around and retrace your steps until you get to the Mason Brook Trail. Take a left onto Mason Brook and follow it down until it comes out at a dirt road in what looks like an old sand pit. This is the Corridor 19 Snowmobile Trail. There is a kiosk just to your left when you come off of Mason Brook onto Corridor 19. Take a right onto the dirt road and follow it up the hill for about 1/2 a mile until you come to a much larger sand pit area. In this area the main dirt road will continue straight on through the sand pit and go a bit to the left. The Corridor 19 Trail forks off this main dirt road and goes just up the hill a bit. Follow Corridor 19 for another 2.4 miles and you’ll be back at Walmart. 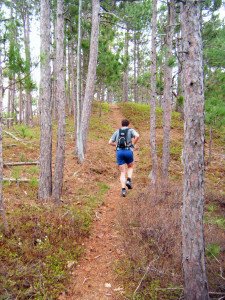 This is a pretty technical run and can be wet and muddy depending on the season. Other Trails – Miles of Single Track but how do I get to it? 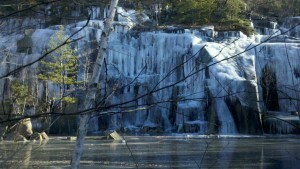 Go to Hemlock Lane in North Conway. To get there, go to the roundabout near Walmart (between Walmart and the Bike Shop off of North South Road) and take the exit of the roundabout that is next to Walmart down Hemlock Lane. Continue by the exit from Walmart and park at the end of the road where there is a kisok and cross the railroad tracks. A. Just follow that road straight across the power lines. It’s a snowmobile trail and goes on for miles and miles and is great for running all year round. This is the NH Corridor 19 snowmobile trail and is quite runnable all winter long once the groomers have been out. Just keep in mind during the winter, this is someone else’s trail and you’re taking advantage of it. So show the snowmobilers some respect and consider making a donation to one of the many snowmobile clubs in the area. It’s their volunteers that keep this thing open. B. Turn around and look behind you when standing at the pillar. You will see raised old railbed with single track on it. That’s the Pond to Pillar trail which snakes through the lower areas and is a blast to run. It’s about 2 miles over to the Pudding Pond area.Pudding Pond trails. It is nicely shaded and deer fly free in the Summer! C. If you go straight on the road, just before the gate across the trail look to your left for a piece of single track that heads up into the woods. That is the beginning of a bunch of unmarked single track trail that goes one for quite a while. There is a lot of choices of crossing trails in there but the rule of thumb is, head downhill the sidehill to get back to the power lines, head up the hill to the get to the ridge. This would also be another out and back and is nicely shaded.
. Continue past the gate for another 1/4 mile or so and you will see the ruins from the old Redstone Quarry. In the middle of the ruins on your left just past the old tool storage area is some single track that goes through the quarry lathe buildings and up to the top of the quarry. Amazing piece of history and some great single track that continues all the way over to the Middle Mountain trail. Thompson Road entrance: Take Artist’s Falls Rd. from Rt. 16/302 in North Conway and cross the North-South Rd. Take a right onto Thompson Rd. and park at the trailhead for the Puddin Pond Loop on the right. Hemlock Lane entrance: Go to Walmart in North Conway and between Walmart and the Bike Shop is Hemlock Lane (and also the new entrance to Walmart). Park at the end of it cross the railroad track to the right a bit you will see some single track that connects to the trails. Is there a map for the trails in the Redstone Quarries?